After seeing Sublime with Rome live back in August I felt it was necessary to cover them. I also wanted to kind of get some things off my chest about this as well, as I have seen many arguments of Sublime with Rome. Now, any Sublime fan or even casual listener knows of lead singer Bradley Nowell's untimely death back in 1996 due to heroin overdose. This left remaining members Bud Gaugh and Eric Wilson to disband Sublime. 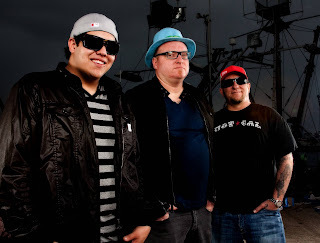 Then a few year ago Gaugh and Wilson stumbled upon the young Rome Ramirez, a very talented singer and guitar player. They began jamming and soon Ramirez became the "featured artist" in addition to the other Sublime members. Then the trouble began. Nowell's family sued them for use of Sublime name without Brad being a part of it. Understandable as it was trademarked to Brad, so they added "with Rome." What bothers me is the constant arguments and statements like: "Rome is replacing Brad, this is horrible," "He is copying Brad," "They are sellouts," blah blah blah. From the videos on YouTube before I saw them live, I thought Rome was doing great job bringing the music of Sublime back for newer generations to hear. What really showed me something was when I saw them live. Numerous times Rome gave a shout out to Brad, and he played his heart out. For almost 2 hours the original members and Rome played all the favorites, even coming back for a few encore songs plus 2 new tunes. For me, this was amazing as I and many others thought they would never get to experience Sublime live. Yes it is not completely the same, but this is the next best thing. Everyone at the concert loved it. I also give much props to Rome, for not only learning every Sublime song, but taking the position knowing he would have tons of people criticizing him. For a lot of the hate he has gotten, he has certainly taken it very humbly and continues to do his thing. I am sure he will continue to win support. Watch a interview with Rome and some live videos of Sublime with Rome below.